All Artworks, shown on this website, show the different kind of mediums that I use in my work. Philosophy and making art, thinking and doing, are in my works two units of the same kind. Particularly I am interested in ur unknown world, the world that is strange and sometimes weird to us. My works show us more often this unknown, weird world in theatrical situations we hardly see in our "real life" . My works are a sort of visual analyses of my thoughts about this, other and maybe better, world. It shows this world as a mindset of what " could be" .... . As a matter of fact, and that is my and our shortcoming, we mostly think or act from out of our cultural luggage we are familiar with. That's my limitation and challenge. In May 2017 Geert received the Francisco Goya Art-price in Barcelona and on the 16 th. of December 2017 he will receive the award “VISUAL ART MASTER"
An unreal world. 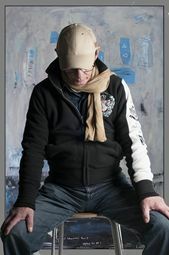 Philosophy and “making art” are in the artwork of Geert Lemmers two units of the same kind. That is why all his projects start with a philosophical analyse, in reading and thinking. Particularly he is interested in our unknown world, the world that is strange or sometimes weird to us. His works show us more often this unknown, weird world in theatrical situations we never see in our “real” life. His works are sort of visual analysis of his thoughts about an other and (maybe) better world. It shows this unknown world as a mindset of what “could be” . As a matter of fact, and that’s a shortcoming item, we only can think or act from out of our own cultural luggage we are familiar with. Similarly these facts count for an artist too and that’s his or her limitation. That’s why Geert tries to bring the different cultures together and mixes them in his work. Geert says "The world of people is about men and women behind often beautiful looking facades in the middle of the chaotic universe we live in. I research the raw site of our lives represented as fairytales in a wonderland as a enlargement of our life. Enlarged characters in chaos, beauty, and imperfection. In every new project I vary on this basic - entities”. Projects and Process. Composing artworks for me almost is a philosophical question in transfering my thoughts in a sort of metaphor representations. These developments help me to transfer my thoughts into strong and compassing images. Life and education. Geert was born in the land of Maas and Waal in the Netherlands, a really mysterious part of the country in where telling stories about whitches and fellowships were normal items. After I graduated in photogaphic art education I worked for magazins making portraits and f.i. fashion photo's. I always wanted to make my own art and after the digital revolution when photoshop came out, I felt comfortable to step in. In 2008 I won the professional artprice in my country and after that I really was succesfull. In no time my work accompanied the work of Corneille, Appel and so on. Expositions and representation In selected countries he is represented by galleries and of course he also has his exhibitions. In The Netherlands there are three galleries who show his work and in the UK for instance Saatchi Art and Rippington Art and in Switzerland Suisse Art.